Please let us know if you can be there for part or all of the meeting. That's why we're making it 2-4pm so more people can fit it into their day. Ideally we'd like you there at the start of the meeting, but you are welcome at any time. And if you have a friend who might be interested in volunteering, please bring them too. Please RSVP by emailing us at 13handsequine@gmail.com. 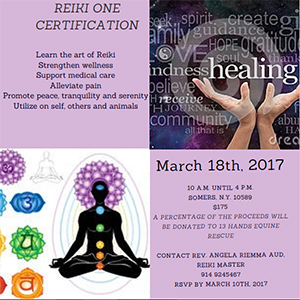 Click for printable flyer (PDF version) Please join us for shopping and refreshments. 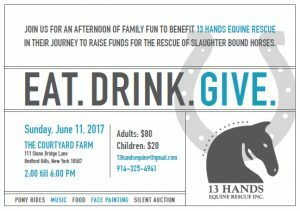 A percentage of sales from this event will be donated to 13 Hands Equine Rescue. Superior quality apparel and gifts for riders and spectators enjoying the equestrian and country lifestyle. 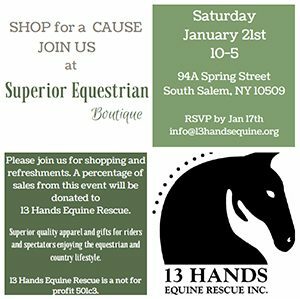 RSVP to info@13handsequine.org by Jan 17th. Stop by, taste the wine, and support 13 Hands Equine Rescue. The evening, sponsored by Pound Ridge Wines & Spirits, will include over 15 featured wines and some delicious nibbles donated from Plum Plums Cheese. A portion of each wine sale will be donated to 13 Hands. There is a suggested minimum donation of $20. Saturday, April 8th, from 6-8pm at Pound Ridge Wines & Spirits, located at 71 Westchester Avenue, in Pound Ridge, NY. plus bake sale Tack * Blankets * Riding clothes * Boots * Artwork * etc. Saturday May 27, 10-2 (Memorial Day Weekend) John Jay Homestead, Rt. 22, Katonah, NY. Sponsored by… Bedford Riding Lanes Association and Endeavor Therapeutic Horsemanship Unsold items will be donated to 13 Hands Equine Rescue and other animal rescue organizations. Please stop by 13 Hands Equine Rescue’s information table and say hello! The Courtyard Farm, 111 Stonebridge Lane.